Last week a Super Smash Bros. leak, known as the Grinch leak, sent the Smash community down a rabbit hole of rumour and speculation that ended up with fans divided into two camps, #teamreal and #teamfake, depending on whether they believed the leak would turn out to be legit. In its Direct today, Nintendo resolved the debate: Grinch was a hoax. But while #teamfake was vindicated, the reality that soon replaced the speculation surrounding the leak has left both sides reeling. The Grinch leak had left some believing, and many more hoping, that Super Smash Bros. Ultimate’s final roster would include Shadow the Hedgehog, Isaac, Ken, Mach Rider, Geno, Chorus Kids, and Banjo Kazooie. That last prospect had people particularly excited, given the character’s origins on the N64 and Nintendo’s increasingly buddy-buddy relationship with Microsoft when it comes to cross-play collaboration. 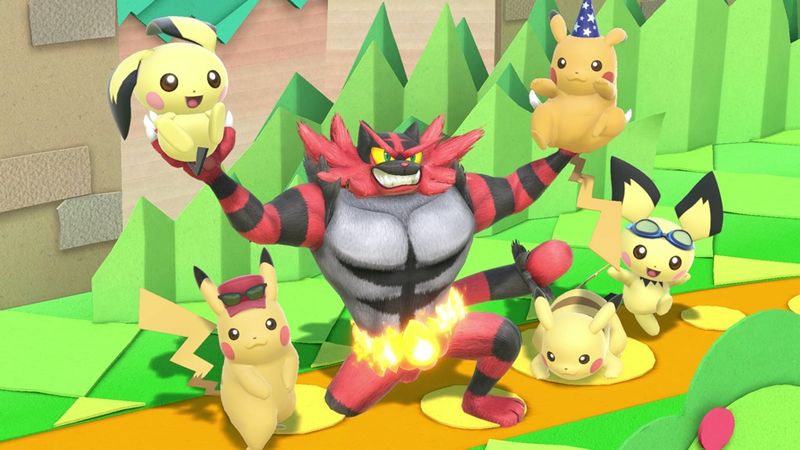 What Nintendo revealed instead, however, was only one character from the rumoured lineup, Ken, who would be joined by Pokemon’s Incineroar. That’s it for the base game’s roster. While Nintendo plans to add six more characters later on, including Piranha Plant, fans’ hopes of seeing the musically inclined bear and bird duo at launch have been dashed. This meant #teamfake was right all along. The Grinch leak was nothing but a masterful hoax, as self-proclaimed Nintendo leakers like Vergeben had said at the time. On GameFAQs, Verge is now being hailed as a prophet, while others who had attacked Vergebean’s credibility in the days prior descended back into name calling. “Some people on here are good sports, but the rest of you still hating on Vergeben are the definition of petty and pathetic,” wrote one poster. Elsewhere, the adherents of #teamreal and #teamfake have been more conciliatory, brought together by a mutual sense of disappointment over how underwhelming news presented in today’s 40-minute Direct seemed to them. Fans had previously debated what either side should do if proven wrong, but now, in the wake of Nintendo’s official news, most appear to be too disappointed to apologise or gloat. Now, many on both sides say they feel doubly trolled, both by the outrageous leak that fuelled their hopes and a Nintendo Direct which appeared to have tried its best to undercut them as brutally as possible. Far from being playable characters, Shadow and Isaac were revealed to be assist trophies, meaning an in-game item can summon them to momentarily help out in a fight. That felt like the cruellest sort of half gesture for certain diehard fans of more obscure video game characters. Fans of Isaac, the protagonist of a JRPG series that stated on the Game Boy Advance, have been voicing their crestfallen feelings. “Wow Isaac being one of the first AT’s shown after Ken & Inceneroar confirmed playable... That hurts,” one wrote on the game’s subreddit. “I’m not even a big Isaac supporter at all but when I saw him as an assist I nearly had a heart attack. That hurt to look at,” wrote another. Skull Kid from The Legend of Zelda: Majora’s Mask has also been at the top of some Smash fans’ wish lists for a playable character. He too was revealed as an assist trophy, helping to spread the disappointment around to other fandoms. The game’s newly detailed Spirits mode, which had been much anticipated following speculation about it during the summer, also came across as a disappointment for many. There is one place fans are still finding some solace as they wipe the dream of a Grinchmas from their eyes: the game’s Fighters Pass. Over the course of the 15 months following the game’s launch, Nintendo plans to release five additional fighters as DLC. It’s possible one or all of these slots could be taken by Banjo Kazooie and others, especially if Nintendo hasn’t even started creating these characters yet. In a GameFAQs thread, Nintendo leaker Vergeben appears to be newly energised following the Grinch fallout and has proclaimed that one of the DLC fighters will be a Square Enix character. Since the game’s release is still just over a month away, Smash fans will have plenty of time to get invested in the next round of rumours all over again while they wait to the play the game itself.